My middie skirt was a trial run for this maxi skirt. I did make a few changes which I put below. Pattern: None, I made this by cutting 2 rectangles and gathering them. The width of the fabric was 45″ but I cut it down to 30″ at the top and then tapered it to the full width at the bottom. Textiles Used: green silk for outer and polyester lining. I got it all from Vogue Fabrics. The Good: I love it. I love the color the silk fabric. I have been wanting a woven maxi for awhile and am really excited to wear it. The Bad : It’s a little hard to walk in especially when the wind is blowing. I am still figuring out how to accessorize it. I think I need a statement necklace or something. Conclusion: Love the skirt and can’t wait to wear it. I am still figuring out if maxi’s are just for spring/fall or if I can get away with them in the summer too. I think I may be maxied out at the moment, but am glad that I made this. PS I am entering this in to the patternreview natural fabrics contest. Cross your fingers for me. I found your skirt on PatternReview (Actually, I also entered the contest 😉 good luck to you! As for accessories, I thought Missoni Spring 2012 had some interesting ideas. Print scarves, fringes on scarves or on necklaces – a lot of fun – check it out! The skirt is gorgeous. I would have no idea how to taper a rectangle down at the top Is it something you do at the fitting process. Curious am only a beginner but would love to try. Beautiful! I really like this! Gorgeous. The color is absolutely beautiful. I love it! 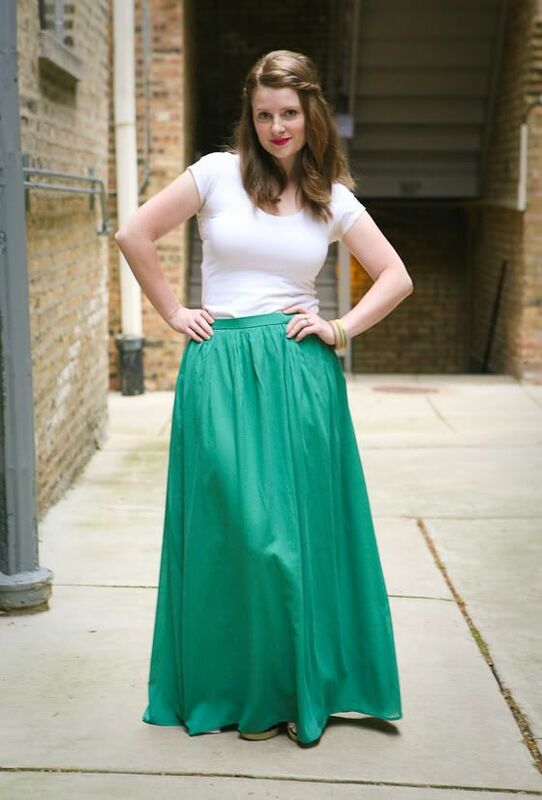 I’m a jeans and t-shirt gal most of the time, but I’ve been turning to maxi skirts as the weather warms up. They’re easy to wear like jeans but cooler and can look more polished with the right accessories. Dreamy colour and I love it with those wedges. What about styling it with a loose singlet? It’s a great color! As long as it doesn’t get too hot where you live, I don’t see why you couldn’t wear it in the summer; it’s flowy and looks summer-y to me! 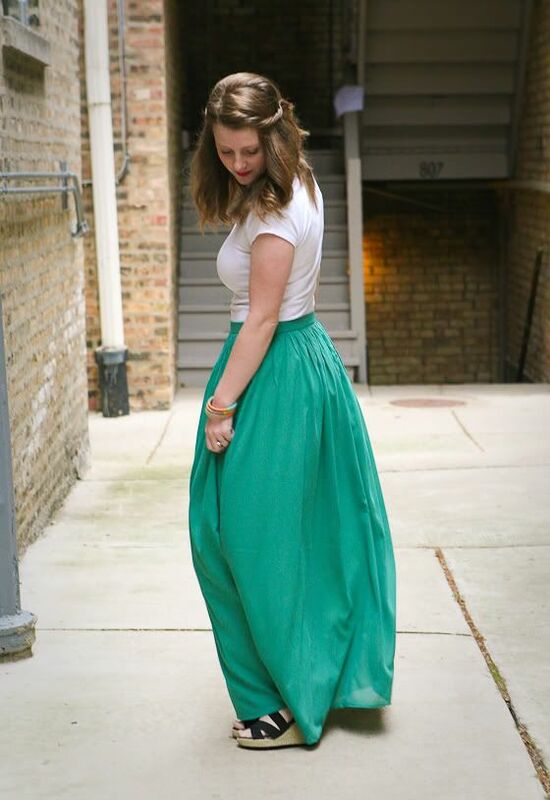 I love maxi skirts all year round. Love the colour and floaty feel of this one. Lovely!! I know you’ll love to wear it. 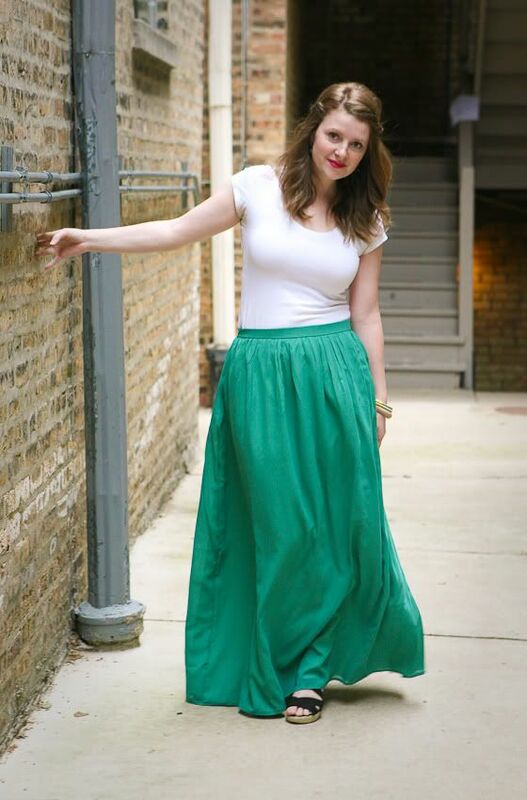 Last summer I made a couple of maxi dresses and wore them all the time, and my recent maxi skirt is getting a ton of wear. They’re so cool and comfortable! The silk will be perfect and so breezy. gorgeous! it looks like it flows and moves beautifully. good luck in the contest! Gawd! Its gorgeous! The green is to die for and looks SO good on you! I totally think maxi’s are for summer!! Absolutely beautiful skirt! And it looks amazing on you! I think I’m going to have to find myself some gorgeous green silk and sew one up for myself! I really love the skirt! It is gorgeous! The thing I don’t uderstand is why you usef polyester lining? For a summerskirt cottonlining is the was to go. Poyester doesn’t breath, that is why everyone get’s so sweaty. I hope one day you try to make another skirt like this with cotton lining, you will feel the difference. Propably you’ll be running around the street shouting “Freedom” :). Lovely skirt!